While I’ve always been known for southern-style BBQ and cuisine, I have been working on a new cookbook. As part of that, I’ve been using quite a few lesser known ingredients in my cooking (well, at least lesser known in Mississippi!) 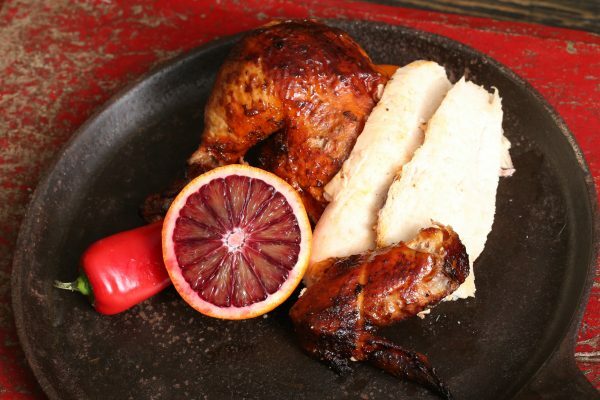 Achiote is a spice that is used quite often in Mexican and Caribbean cuisine, and this Achiote and Blood Orange Chicken takes full advantage of the wonderfully earthy flavor of it. Achiote, also known as annatto, has a mild earthy, peppery flavor, and is often used to color dishes. I love it on chicken because it adds a depth of flavor and a beautiful color. You can find Achiote in either a paste or liquid form at any mexican food market, or the new world market, Amazon (where I get almost all of my esoteric ingredients!) To me, it reminds me of the flavors of an adobo sauce. It adds a bit of savoriness or umami to this recipe. I cooked this achiote and blood orange chicken on an Arteflame! If you haven’t seen them, check them out on their website. They look really great on a patio and are super fun to cook on, especially with a group of friends. 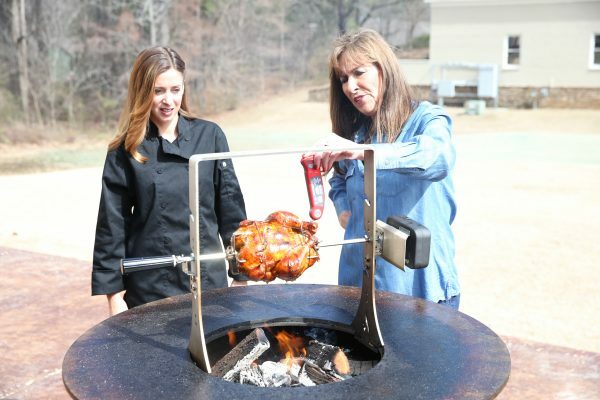 This can easily be cooked on any rotisserie grill, but it’s so much more fun with big flames! 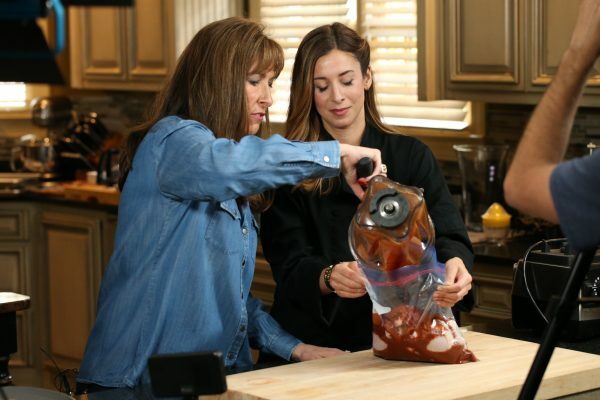 For this recipe, I had Lindsay “Mama” O’Neill over, and we filmed it (please watch and like the video!) We used Greensbury Farms Organic Whole Chickens, and I will tell you they were fabulous! This is actually a simple recipe, though the marinade does need at least 12 hours to work it’s magic (24 hours is better!) Helpful hint- truss your chicken before placing it in the marinade. You will save yourself a large mess! 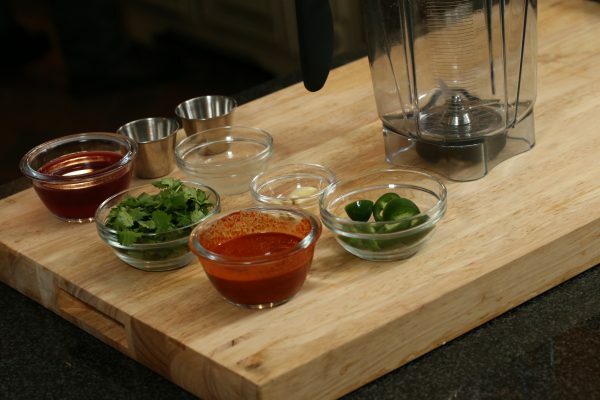 Place all Marinade ingredients in a blender and puree. Truss chicken, then add chicken and marinade ingredients to a resealable bag and press out as much air as possible. Marinate at least 12 hours or up to 24 hours. 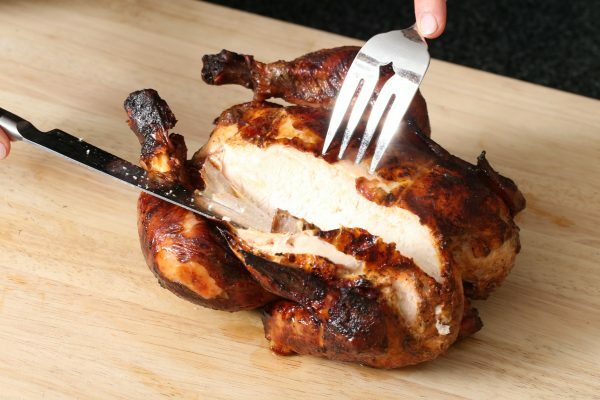 Remove chicken from marinade, and allow to drain slightly in a pan, then place on spit and secure with spit forks. 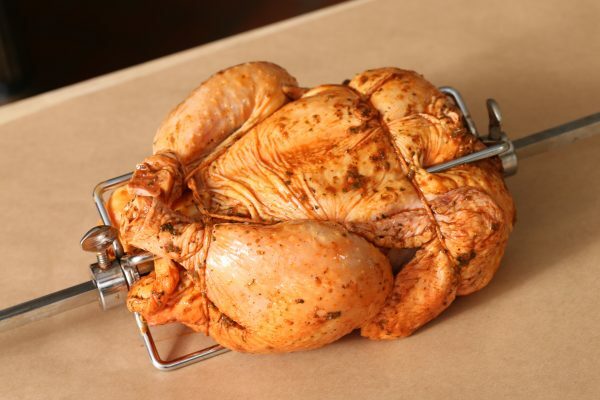 Place chicken on rotisserie. For this dish I keep the flames high! You want some searing on the skin to keep it crisp. It is imperative to use an instant read meat thermometer. Remove chicken from flames when it reaches 170 degrees in the thigh, then lightly cover and allow to rest for 5-10 minutes. Carve and serve. Plate Chicken- Delicious and pretty!